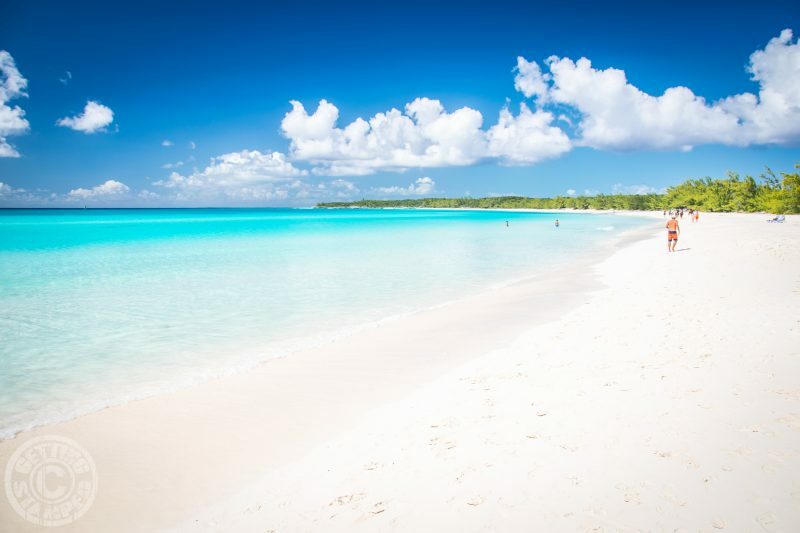 Half Moon Cay is a slice of heaven just floating in the Caribbean. Half Moon Cay is one of the 700 islands that make up the archipelago of the Bahamas. Less than 100 miles from Nassau, it’s a tropical paradise for those cruising with Holland America Line. Our first taste of the Bahamas was on our Holland America Line Eastern Caribbean cruise. Here’s a sneak peak of what a day on Half Moon Cay Bahamas looks like. We didn’t want to leave Half Moon Cay but before we knew it the MS Eurodam was waiting for us to board the ship so we could cruise to our next destination. Holland America purchased the island in 1996 for a steal for only $6 million and has since invested $15 million to create the private island paradise for passengers on the line’s Caribbean and Panama Canal sailings. Carnival ships sometimes visit as well, as Holland America is part of the Carnival Corp. The island wasn’t always called Half Moon Cay, for most of its existence, the island was known as Little San Salvador Island. When we first pulled in we immediately noticed the 2.5-mile long beach, white sand just waiting for our footprints. Half Moon Cay is 2,400 acres in size, but only 50 acres have been developed. The remaining acres include a 700-acre lagoon, a Wild Bird Preserve and a wildlife sanctuary. Half Moon Cay is basically a deserted island except for 10-20 Holland American workers that live on the island year-round. There are locals from the nearby islands that come to sell art, crafts, and souvenirs when the ships come in. Our cruise ship anchored offshore and we had to take a double decker tender into Half Moon Cay Pier marina, which took 10 minutes from our ship to shore. From the pier another 1-minute walk to the welcome center which is complete with an information booth, bathroom, a bar, Bahamian straw market, ice cream shop, post office, first aid station, island shop and tram stop. We made our way to the information booth as we had a jet-ski adventure planned! There are tons of excursions from horseback riding on the beach, lagoon tour, glass bottom boat tour, kayaking, snorkeling, bicycling, hiking, or just relaxing on the white sand beach. We started our morning with an hour jet-ski adventure, we strapped on life jackets and took off into the open ocean. We had an amazing time getting speed, and even some air, as we flew through the waves. I managed to stay on my jet-ski the entire time unlike our last time jet-skiing in Langkawi! After an action-packed morning, it was time for some relaxation on Half Moon Cay’s famous white sand beach. Half Moon Cay is known for the number of private cabanas available for rent during the day on the island. There are 15 cabanas available that come with refrigerators, air conditioning, table & chairs, deck chairs, and a misting shower on a private terrace. We opted to rent sunshade on the beach, as we spent most of our day walking the beach and playing in the gorgeous turquoise waters. Before we knew our time in the Bahamas was over and it was time to tender back to our cruise ship. Half Moon Cay was our favorite stop on our Eastern Caribbean cruise and a place we hope to get back to. I can’t imagine anything better than Tahiti and Bora Bora. I will see for myself in 3 weeks. The water in Half Moon Cay is def some of the best in the world. What’s the best you’ve ever seen? Def a great investment for Holland America! This is what vacation feels like. Perfect white beaches, endless sparkly beach sands and a whole lot of activities to enjoy. This place is just amazing. Great to hear we added Half Moon Cay to your bucket list! It looks as if you are having the best time! Amazing pictures and it all looks so wonderful, I want to jump on a plane! Jump on that plane you won’t regret it! Yes it’s amazing water, some of the best we’ve seen world wide! This water looks unreal and your hot pink suit makes me want to sip on pina coladas and be on vacation! Amazing photos!